The development of effective means to enhance research integrity by universities requires baseline measures of individual, programmatic, and institutional factors known to contribute to ethical decision making and behavior. In the present study, master’s thesis and Ph.D. students in the fields of biological, health and social sciences at a research extensive university completed a field appropriate measure of research ethical decision making and rated the seriousness of the research issue and importance for implementing the selection response. In addition they were asked to rate their perceptions of the institutional and departmental research climate and to complete a measure of utilitarian and formalistic predisposition. Female students were found to be more ethical in their decision making compared to male students. The research ethical decision measure was found to be related to participants’ ethical predisposition and overall perception of organizational and departmental research climate; however, formalism was the only individual predictor to reach statistical significance and none of the individual subscales of the research climate measure were significantly correlated to ethicality. Participants’ ratings of the seriousness of the issue were correlated with their ratings of the importance of carrying out their selected response but neither was significantly predictive of the ethicality of their responses. 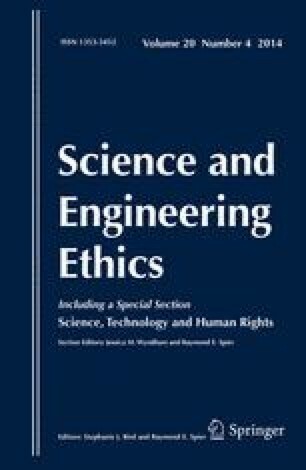 The implications of these findings for the development of more effective training programs and environments for graduate students in research ethics and integrity are discussed. The authors wish to acknowledge and thank Matthew R. Pearson for his helpful comments and suggestions and Tamara Doyle and Amber Johnson for their contributions to the present effort. Dr. Channing is an American anthropologist studying agricultural practices of the Mofu people of Cameroon, Africa. Due to the demanding nature of this project, which requires frequent travel to Cameroon and lengthy periods of data collection, Channing has not published any of her findings yet, although she has one paper under review. The delay has been unavoidable, but tenure review is only a year away, so the pressure to publish is building. Event 5.4: The paper is accepted pending minor revisions and Wilson, one of Channing’s graduate students, reanalyzes data from the Mofu project for his Master’s thesis. The student finds that in her haste to get the data analyzed, Channing omitted some of the agricultural plots. When included, the important differences are reduced to marginal significance. The pressure to get the paper out is now overwhelming. Which of the following best describes your assessment of this situation? How should Channing handle this news? Please choose TWO options that you feel are optimal responses to the given issue. Allow publication to go forward and then send an erratum, describing the oversight and correcting the analysis. Withdraw the paper from review and correct the results. Do not accept Wilson’s conclusions without reviewing his analyses thoroughly; only notify the editor of a problem if she is convinced a problem exists. Keep the results section as is, but emphasize in a revision that the readers should be cautious about interpretations because more work on this topic is needed. Leave the results as is given that the analysis showed that the revised findings follow the same trends and were very nearly significant. Confer with the other co-authors of the paper and see if they feel that Wilson’s revelations should be taken seriously. Tell Wilson about the importance of preserving the original finding and work with him to transform or restructure the data until the results pass the test of significance. Discard some outlying data points that were dubious to begin with; this will return statistical significance. Report and justify the changes in the resubmission. How important is it that your responses to this issue be carried out?